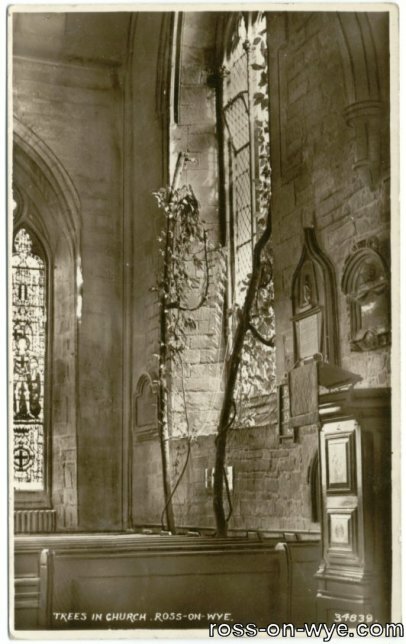 Trees or plants growing on churches is reasonably common but them growing naturally inside is a rare occurance with very few recorded occurances. 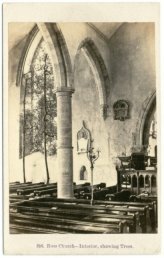 One occurance relates to St. Mary's church Ross-on-Wye where great elms were planted in rows enclosing the curchyard to make the yard a delightful retreat during the hot days of summer. These were supposedly planted by John Kyrle but this may have been done to add some additional romanticism to the tale and it is contested in some guidebooks3 of that period. The story goes that one of the elms was "impiously" cut down by a certain rector because it excluded the light2. As a result of this, first recorded in around 1811, a pair of suckers from the trees penetrated the walls. These grew from the pew where John Kyrle used to sit in front of the north isle window and in the early 1880's these were around twenty feet high1 and they were trimmed when they reached the roof2. The north isle window is east facing and thus it is slightly unusual that the trees should have flourished so well. These suckers and their story were a major tourist attraction with many references to them in Ross and Wye Tour Guidebooks until by 1886 the suckers had died1. The memory of the suckers, and the tourists visits, continued as Virginia creepers were planted in a trough and wound around the now dead suckers. These stumps continued to be used to support the creeper until 1953 when woodworm meant that the remains of the suckers had to be removed and were replaced by iron stands. 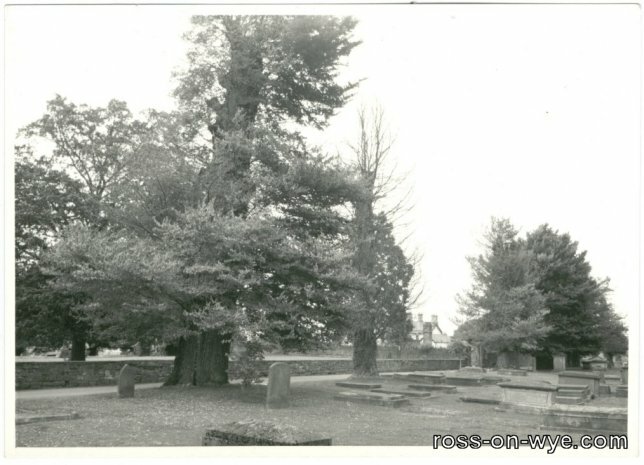 The remaining elm trees were cut down in 1974 after they were ravaged by Dutch elm disease and damaged in a storm after which they were deemed unsafe. 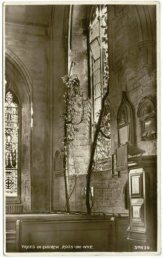 The vines can still be seen in the church today growning up the iron stands.